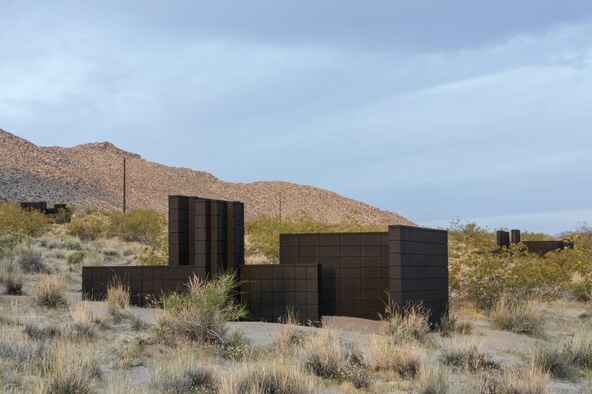 The integration of art and life is a perennial topic for magazines, books and podcasts but one contemporary artist in particular has committed her life to this ideal: Andrea Zittel. Since 2000, she has been living the ideals of a modernist ethos combined with full immersion into notions of sustainability. She was off the grid before Dwell magazine made it fashionable. This month offers a unique opportunity to see her art in three different manifestations, though some serious driving is involved. At Regen Projects, Planar Configurations consists of powder coated metal structures in shiny black, white and gray accented by panels of yellow, blue and red. In color and form, you see the origins of De Stijl, the movement associated with Mondrian and the early 20th century origins of European modernism. But each of Zittel's colors is individualized with added warmth: dark blue is ultramarine, her yellow more like ochre, red more like salmon. What appear at first to be horizontal and vertical planes precisely arranged in the gallery prove to be open containers for at least the notion of rest or relaxation. 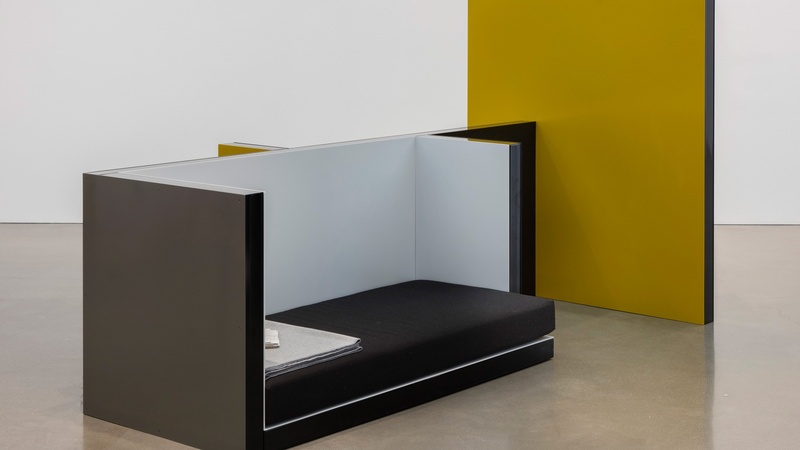 Some have gray cushions and a newspaper or a blanket woven by Zittel invitingly placed within. 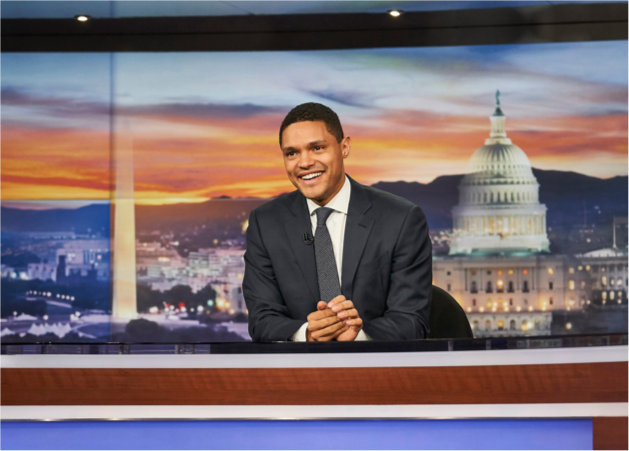 Viewers are encouraged to sit down. Pieces are both individual and placed in relation to one another as an entire environment. 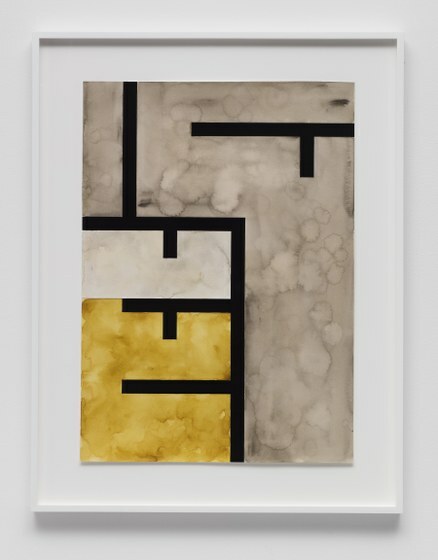 Her working plans for her sculptures, blocks of soft neutrals, are tight in composition but rendered with a soft watercolor technique on paper that adds an organic, intuitive feel. 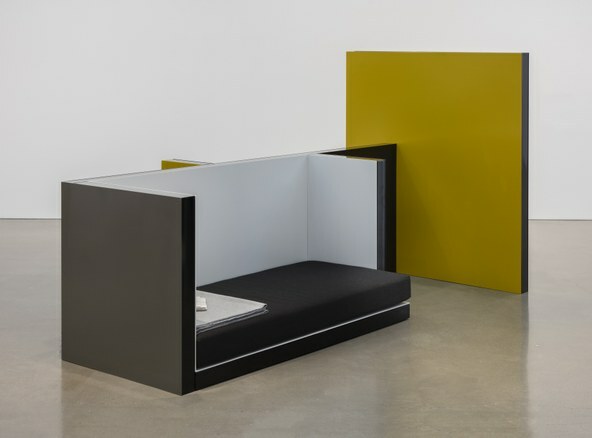 Zittel has dedicated herself to breaking down perceived and actual boundaries between the work she makes, which is designated as art shown in galleries and museums, and the involvement of those who are usually designated as observers, instructed not to touch let alone have a seat within the art. Wallpaper's Nick Compton called them, "constructed worlds, of impeccable modernist taste, taken apart and put back together again." Before her MFA at RISD, Zittel got her BFA at San Diego State . 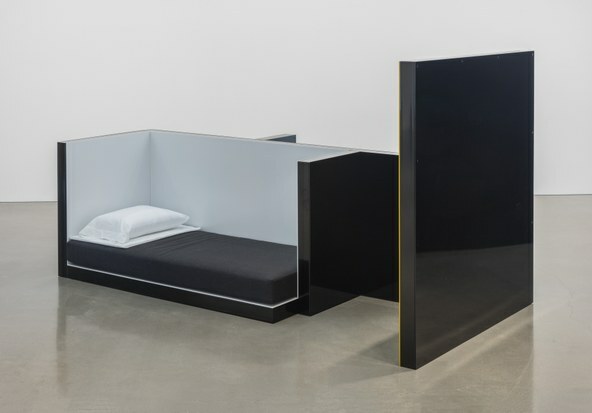 Among Zittel's early sculptural works were fully contained living environments in trailers that could be moved from site to site. At A - Z West, her studio and home in Joshua Tree, similar mobile pods are available for visiting guests and workers. Looms there provide fabrics for her clothes as well as the blankets in the current show while a ceramics studio produces plates and bowls and other items. Produce is grown on site. Everything, however, looks and feels like the production of a singular individual. The other half of this exhibition, Planar Pavilions, consists of ten structures built of concrete block, painted matte black, that she had built on a grid on the land in front of her studio. Formally, they echo the shapes of the sculptures at Regen but consist only of vertical walls. They are open to visitors who want to rest within them even though they are on land owned by the artist. Obdurate and striking, un-camouflaged, they confront notions of indoor and outdoor, nature and culture, individual choice and conditional behaviors. They look simple but big ideas are at play. To better understand Zittel's ideas, visit the Palm Springs Architecture and Design Museum to see On the grid: a look at settlement plans in the high desert. A piece donated by Zittel includes a topographical map of her studio and the land around it. She has systematically acquired small, square parcels of land that were given by the US government in 1938 to anyone who would build a structure of a certain dimension. That grid of land and those "jackrabbit" shacks erected on parts of it provided the impetus for much of her own investigations. The wallpaper in the gallery, looking like decorative patterns, is actually a repeated aerial photograph of Nellis Air Force Base in Nevada. The show, organized by Brooke Hodge, includes books, photographs and other archival materials pertaining to the settlement of the Joshua Tree area. But hurry. It continues only to July 26. The show at Regen continues through August 12. Planar Pavilions is a permanent installation.